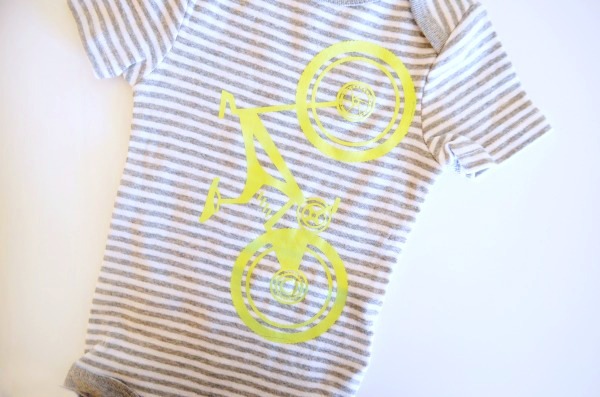 My latest craft obsession is heat transfer vinyl shirts, onesies, bags, anything. My friend Ashley over at Cute as a Fox introduced our little craft circle to the best practice using a heat press , and Expressions Vinyl stocked us up with a variety of HTV sheets to continue our ventures. 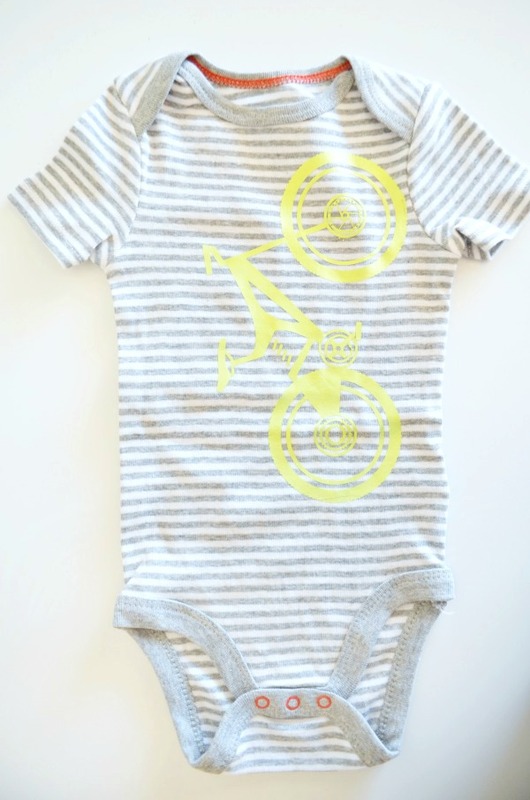 I’m so excited to share this awesome bike onesie with you. I’m starting to dive into crafting my own graphics, or having my artistic husband draw for me, but for this project I grabbed clipart on the open market. After downloading I can upload into my cutting software. OpenClipart.org has an .svg file option making it an easy one step upload to the Cricut design software. Upload image, then size image in cutting software. I used an 8″x4.7″ image size for a 6-9m onesie. 2. Place vinyl, plastic side down, on the cutting mat. 3. In software mirror image, set machine to vinyl, cut. 4. Weed the image leaving only the graphic behind on the transfer plastic. 5. Press out the wrinkles on your onesie. Place vinyl in desired location. Cover with teflon pressing sheet. 6. Press according to the time and heat settings for your vinyl. You can accomplish the same effect with an iron if you don’t have access to a heat press. I love using the heat press for professional quality designs. it applies even pressure and heat across the design creating a very well bonded image. A few of the designs I’ve made already have stood the test of weekly washings for months without peeling or distortion. 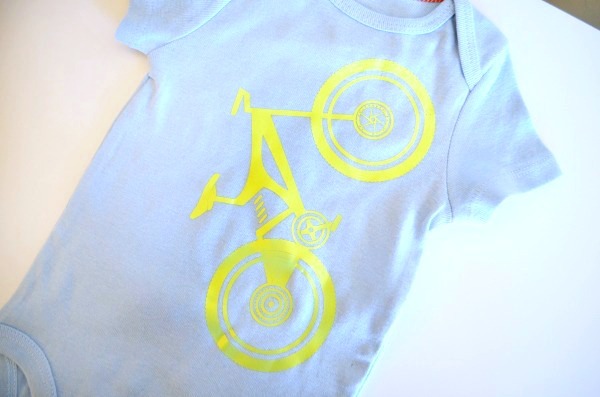 For even more baby gift ideas and crafts checkout these ideas. 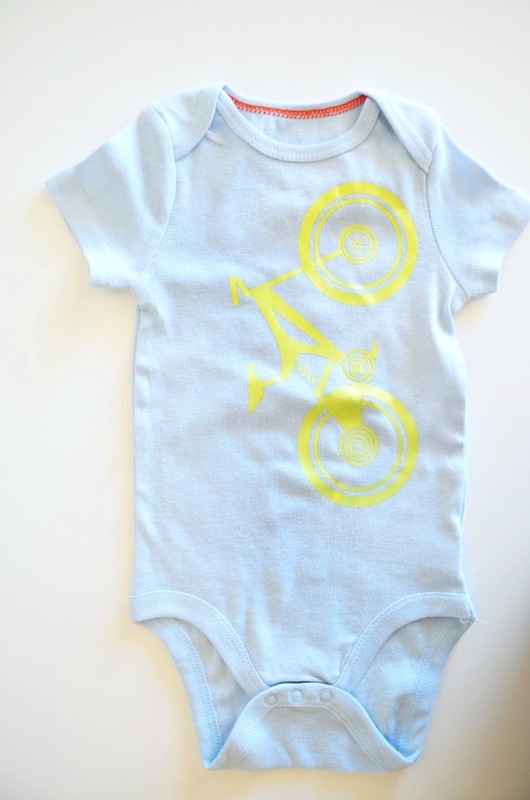 The bike onesies are just precious. I can see my grandsons wearing these.